EVERYBODY CAN HELP ECGRR – In just 3 easy steps! It’s summ er time and once again ECGRR finds itself overwhelmed with the intake of dogs and not enough fosters. 1. DOWNLOAD our new ECGRR WANTED POSTER and print out a few copies. Optional – take some scissors and cut along the vertical dotted lines between the contact slips to make them easier to tear off – that would be a big help. 2. 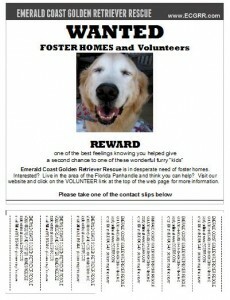 POST the ECGRR WANTED POSTER in locations for others to see. – anywhere dog lovers gather and talk dogs! 3. Give yourself a pat on the back – you just helped spread the ECGRR word and our big need for fosters. Thank you! and to be viewed/printed, requires the Adobe Acrobat Reader. require the reader, CLICK HERE – a free download. 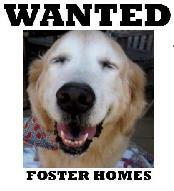 If you live in the Florida panhandle and can open your home to be one of our foster homes – wow, that would be great!! Just fill out our volunteer application to get started.